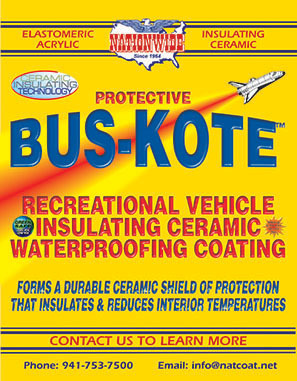 Bus-Kote Recreational Vehicle Roof Coating | Nationwide Protective Coating Mfrs. Nationwide Protective Coating Mfrs., Inc is best known for our superior lineup of Elastomeric Acrylic, Reflective, Energy Saving and Insulating Ceramic Waterproofing Coatings available worldwide since 1964. We also service the growing Recreational Vehicle market and have developed the best RV and Bus Coatings available. Our Bus-Kote product delivers an Energy Saving, Insulating and Waterproofing Coating that combats the destructive environmental forces of nature. This easy to apply Bus and Recreational Vehicle Coating System just increased the warranty from 7 to 10 years because it performed so well and will provide many years of durable protection and works on any bus or R.V. It is a bright white matte finish and can be color tinted to match any color, making Bus-Kote a great choice for both new vehicles for preventative maintenance as well as aging buses and R.V.’s with failing roofs. Don’t Reroof, Bus-Kote!